I’m pretty pleased with myself that I’ve managed to do nearly three weeks of the daily photo. Every day I’ve used my iPhone and the Hipstamatic app to shoot the photos. I also have the Flickr app on my phone which I use to upload the photo as it allows me to immediately add it to a set and tag it and so on which saves me having to go back in via the web and do it that way. The photo above isn’t one of my dailies, it’s an extra that I really like. I took it our work dinner a couple of weeks ago. We had a room to ourselves and this light was in the centre of the room. I can think of a few places I’d love to hang that! 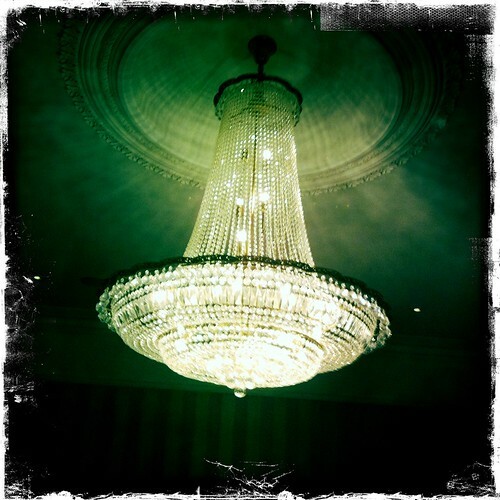 Magnificent chandelier. It needs recognition, it’s purpose is beyond its beauty.